My dog ate river stones and 2 of them got stuck in his intestines! He survived the operation, and my wallet survived the $1000 bill. 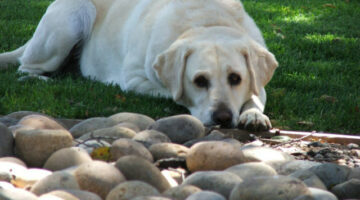 Here’s what you should do if you think your dog ate some rocks, stones, or pebbles. Whenever we’re preparing for a really bad storm, I make a point to gather the dog’s necessities, in addition to our own. Even if you’re not officially evacuating, you never know when you when you might need to seek shelter somewhere else at the last minute. Or, you may even have to stay in a public shelter temporarily if the storm wreaks havoc on your entire neighborhood. Here’s what to pack for your dog. 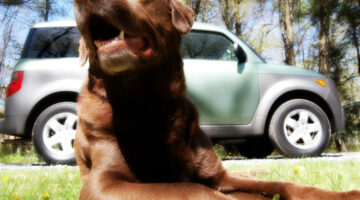 Good News: Auto Insurance Covers Pets Injured In Car Accidents! Dogs and cats are now covered by most car insurance companies — at no extra cost to you, the pet owner — should they be injured in an auto accident! Well… almost. We paid $2,500 for our dog’s TPLO surgery to repair a torn ACL in his knee. 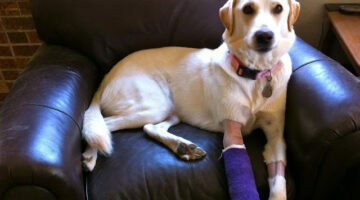 Actually they replaced the ligament and cartlidge from our dog’s knee with a metal plate and 6 screws. Here’s how it went for us. If you have pet-proofed your home, then you have taken very important steps to ensuring the safety of your pet. However, if you have not pet-proofed your yard, your dog could still be in danger. Quick Tips: How To Get In & Out Of The Vet Fast! Here are a few tricks that make the process of going to the veterinarian’s office quick & painless — for all involved. The secret is: the time of your appointment! 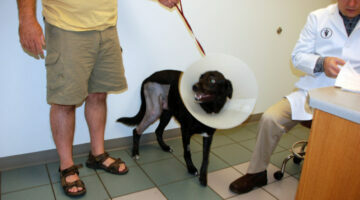 The Brown Dog Foundation helps dog owners who are facing expensive vet bills in order to save their dog’s life. As long as you are willing and able to pay a portion of the veterinarian’s cost to save your dog’s life, the Brown Dog Foundation will help pay the rest! Do Dogs Need To Wear Life Vests When Boating? Does a dog have to wear a lifevest when on board a boat? Everyone knows that people have to wear lifejackets on boats, but do dogs? Here’s what you need to know about dogs and life vests. 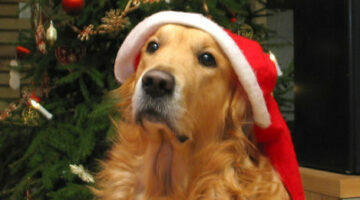 There’s no better resource for a dog owner than a veterinarian’s blog. Not only are vet blogs filled with little-known facts and behind-the-scenes info that few are privy to… Vet blogs also show the personal character, fortitude, and never ending love for animals that veterinarians have, day in and day out. These are the best vet blogs… ever! I refer to them often for their professional expertise and personal opinions.